For the first time in several years, Ken and Lisa Theriot will not be attending Pennsic, the annual event where they normally play live. This is due to several complications with scheduling and numerous other pesky non-musical real-life must-do things. But something actually kind of wonderful happened when they started telling folks they’d be absent this year. 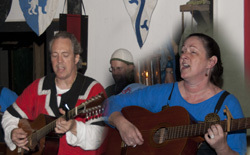 Other musicians who also regularly attend Pennsic and perform said that though Ken and Lisa would be missed, this would give them an opportunity to learn and play their songs. Ken said in a Facebook post that he thought that was awesome. We didn’t realize there were that many people out there who wanted to perform our songs, but were holding back because they didn’t feel right playing them at an event where we would be present. Not only is it a great thing that people want to perform our songs, but it sort of allows us to be there in spirit. Music is a pretty powerful thing isn’t it? In addition to live performances by other terrific musicians, the music of Ken and Lisa Theriot can also be bought from Camelot Treasures, booth 30 in the merchants area. And if you want to perform songs yourself, you can get sheet music right here on the site, including the Human History Bard Book. Now you have no excuses:). If you are unfamiliar with the music of Ken and Lisa Theriot, take a listen to clips of their music in the carousel of on the right side of this page (with the exception of the Christmas CD The Gifts of Midwinter, they record separately under Ken Theriot and Lisa Theriot). So if you’re going to Pennsic, please feel free to learn and perform their songs.